This ranking of the top financial modeling training websites orders them according to their monthly traffic. The traffic data is from similarweb.com, which provides website traffic statistics and market intelligence. Website traffic is a vital metric for web-based business and is usually a critical business driver that has a high correlation to the number of users. Source: SimilarWeb Estimates, October 2018. The chart above displays the top-ranked financial modeling and related training companies, sorted by monthly website traffic. This data is based on public information from similarweb.com. Corporate Finance Institute (CFI) is ranked number one (#1) on this list of financial modeling training websites, with over 3 million visitors in the month of October; second is the finance forum Wall Street Oasis (WSO) with 2.6 Million visitors in the same month; and next are, CFA Institute, Wall Street Mojo, Mergers and Inquisitions, Wall Street Prep (WSP), and Breaking into Wall Street (BIWS). 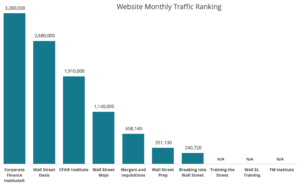 The financial modeling training providers Wallst-Training, Training the Street (TTS), and FM Institute (FMI) did not have enough traffic to show up on SimilarWeb traffic estimate. Our Financial Modeling Competition is a great way to practice your valuation skills. Check out the Competition Guide, and the Overview of the 2018 Competition.